Lor Mee (in Hokkien) literally means Braised Noodles. 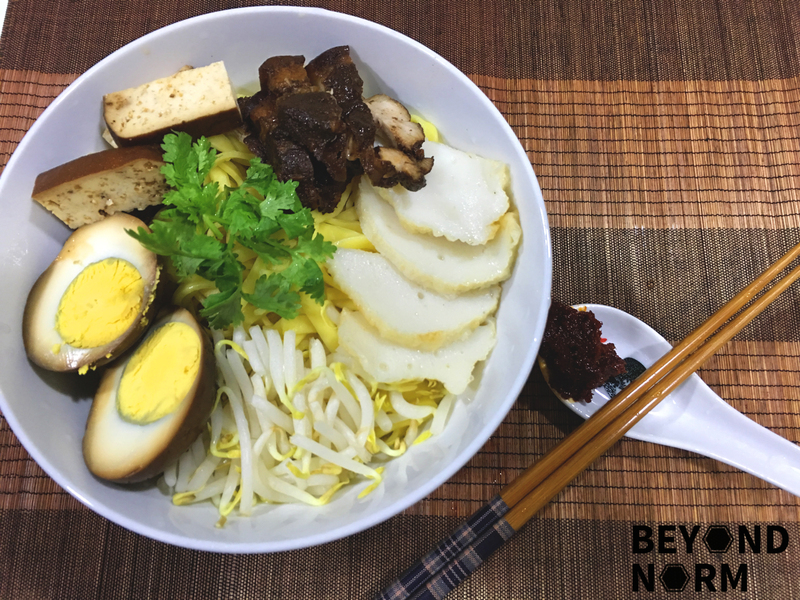 The yellow noodle is soaked in a dark gooey sauce topped with yummy braised meat, eggs, bean curd, and other ingredients. 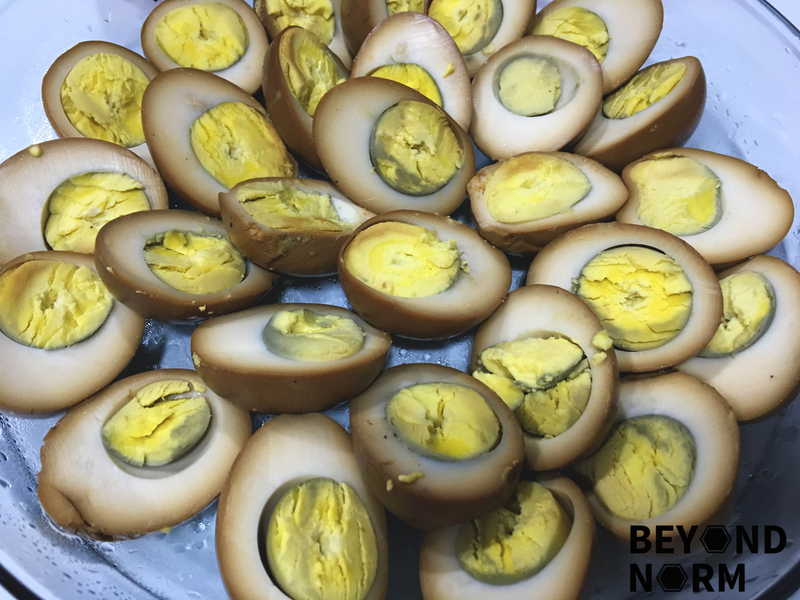 Being a Teochew, when I was growing up I was always exposed to a more Teochew style of cooking from my mum. As such, I was never introduced to this noodle dish at home; hmmm… I wonder why? Don’t hesitate and try it for yourself if you love Lor Mee or if you are like me before, hesitate no more and just do it!! 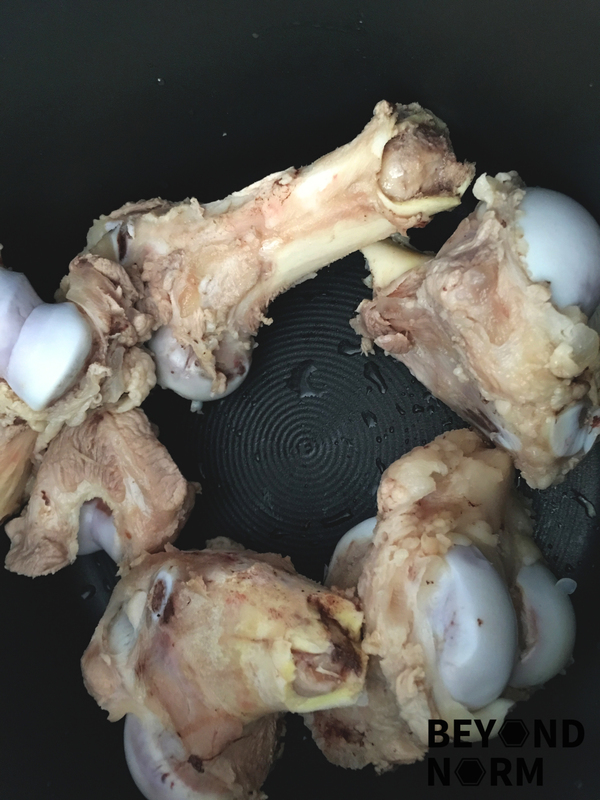 Rub some salt on the pork bones and set aside for 5 minutes. Rinse off the salt and transfer to a stock pot. 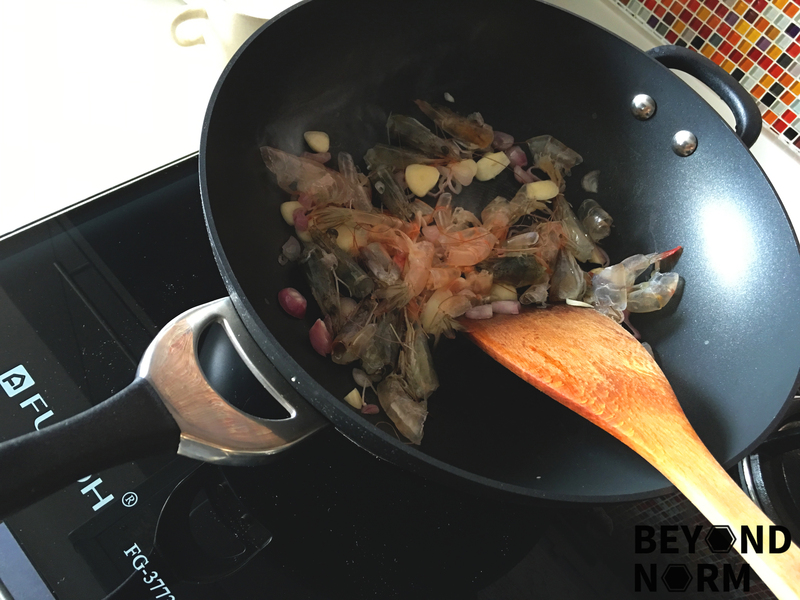 Heat up oil in a non-stick pan and add in shallots and garlic and sauté till fragrant. Add in the prawn shells. Sauté for 3 minutes. Add 12 cups of water into the pot and bring it to a boil. Simmer for 1 to 1½ hour. 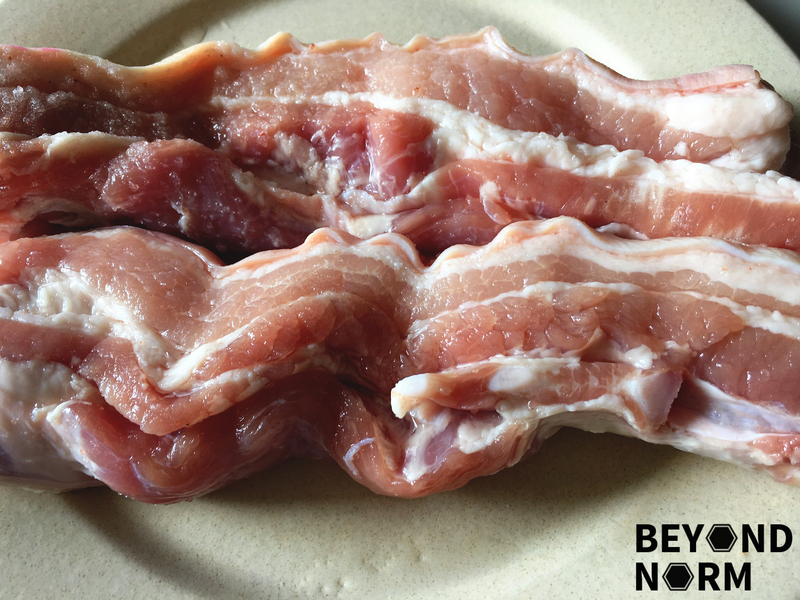 Rub some salt on the pork belly and set aside for 5 minutes. 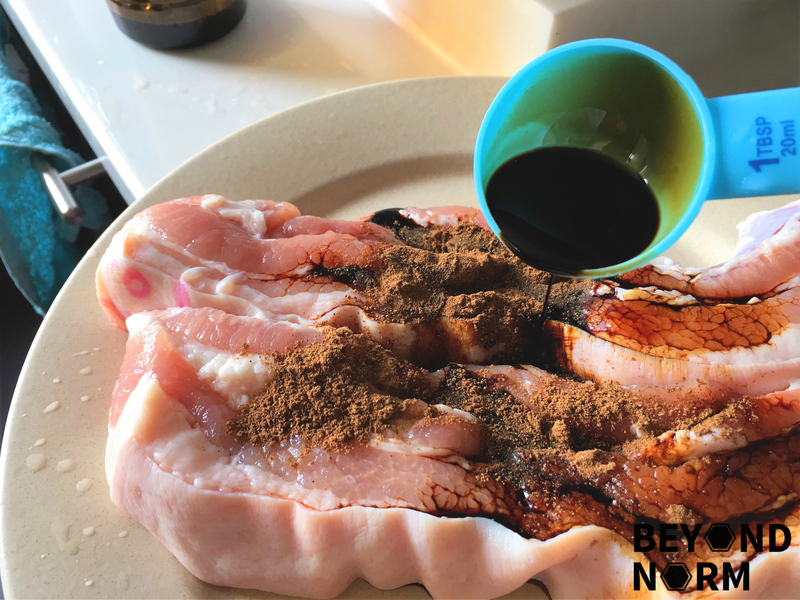 Rub ½ tablespoon of five spice powder and 1 tablespoons of dark sauce on the pork belly and let it marinate for 30 minutes. Heat up a non-stick pan and add 1½ tablespoons sugar till caramelized. Transfer pork belly and coat one side first with the caramelized sugar and then turn to the other side. Add 5 cups water from the pot into the pan, which the pork belly is sitting in. Next add in the dark soya sauce, rock sugar, sliced ginger, lightly crushed garlic and 2 tablespoons of five spice powder and bring it to a boil. 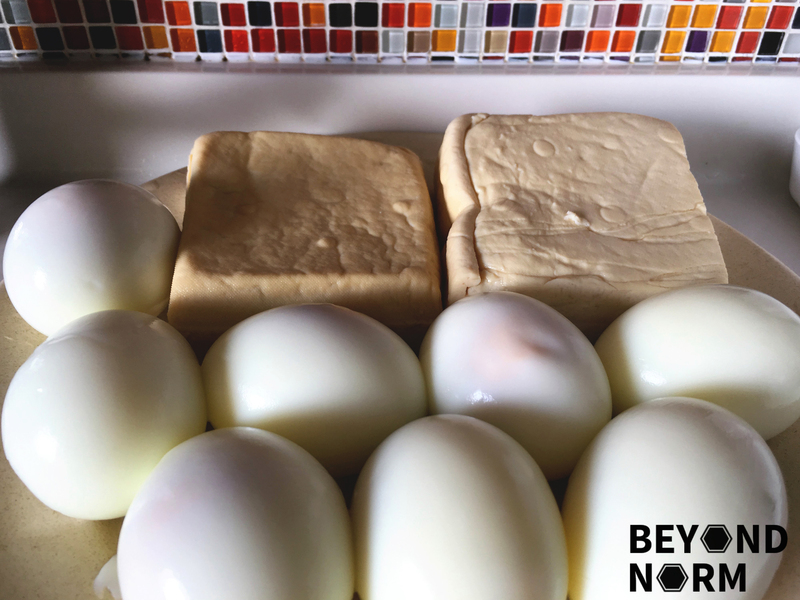 Add in hard boiled eggs and firm bean curd. Reduce heat and simmer for 30 to 40 minutes or until meat is tender. Remove the pork belly, eggs and bean curd to cool. 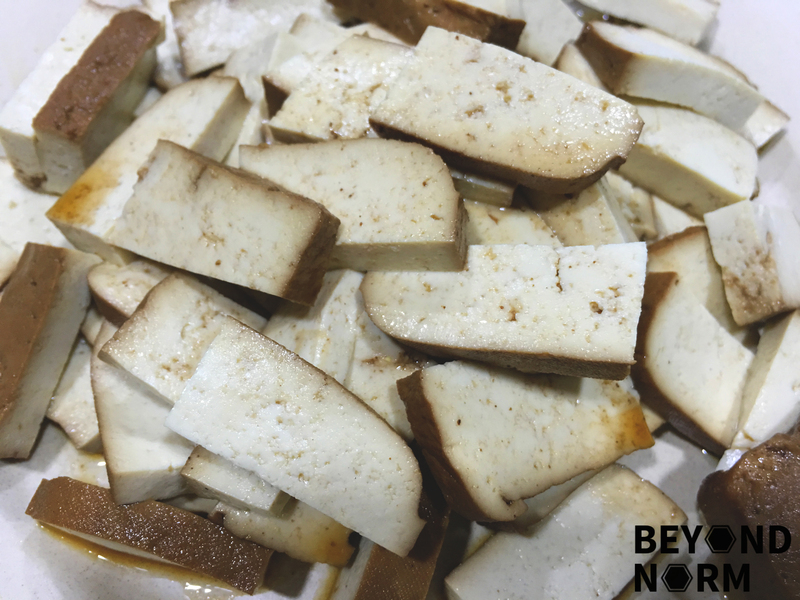 Cut the pork belly into slices, half the eggs and cut the bean curd to slices and set aside. 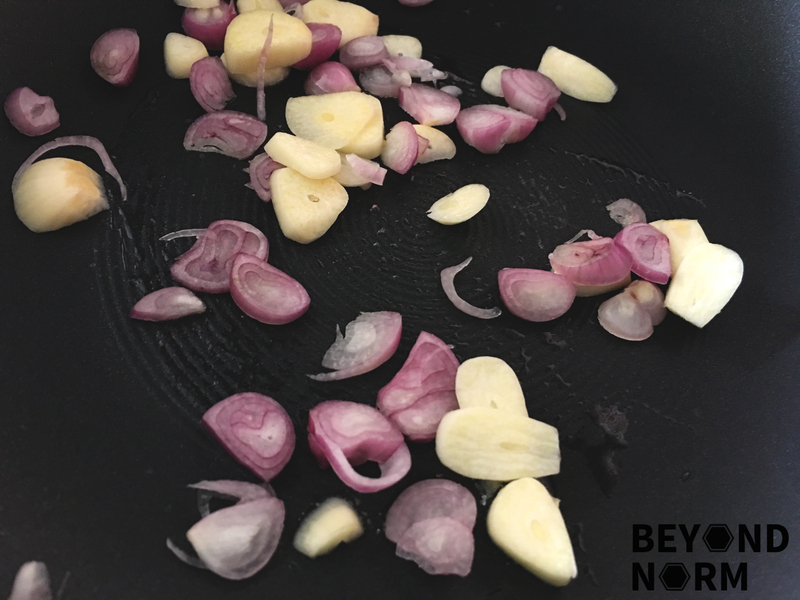 Strain and remove ginger and garlics slices from braising liquid. 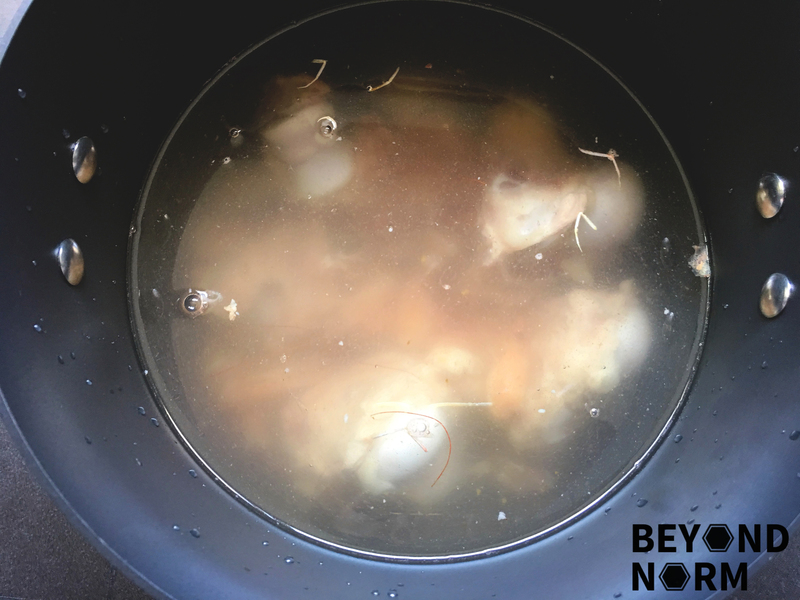 Add 4 cups of the pre-made stock to dilute the strained braising liquid. Add in the Chinese black vinegar portion by portion (taste as you add in as some might find it too sour. You might want to add less than ½ cup or might want to add more depending on your taste). Adjust taste by adding salt or sugar and bring it to boil. 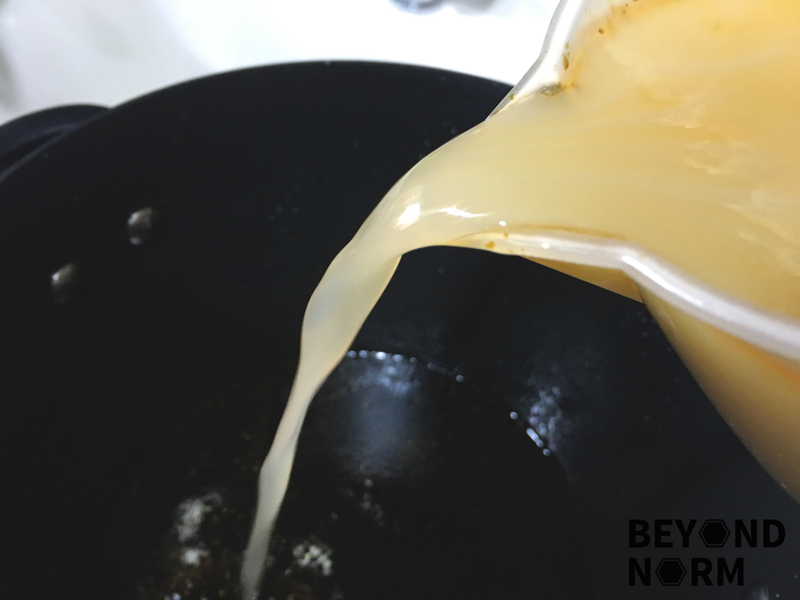 When the gravy is boiling, add in the beaten eggs gradually and use a big ladle to stir it in a circular motion as fast as possible. It will become an egg drop or egg flower soup. Next put 1 cup of cold water into the corn starch to form a solution and stir well. Then gradually pour it in to the hot boiling gravy. Keep an eye on this process. If it is too sticky, stop the addition. If it is too watery, add in more starch. Remember to stir the gravy continuously. In a saucepan or pot, bring some water to boil. Blanch the bean sprout lightly, drain and set aside. Blanch the sliced fish cake lightly, drain and set aside. Blanch the yellow noodles for 2 to 3 minutes and immediately transfer them. Put it under a cold running tap to prevent it from becoming soggy. In a serving bowl, put the blanched yellow noodles, bean sprouts, fish cake, braised pork belly, eggs, bean curd, and fried wanton. Add in the hot gravy; just enough to cover the ingredients. Garnish with the chopped Chinese celery and fried shallots (if using). 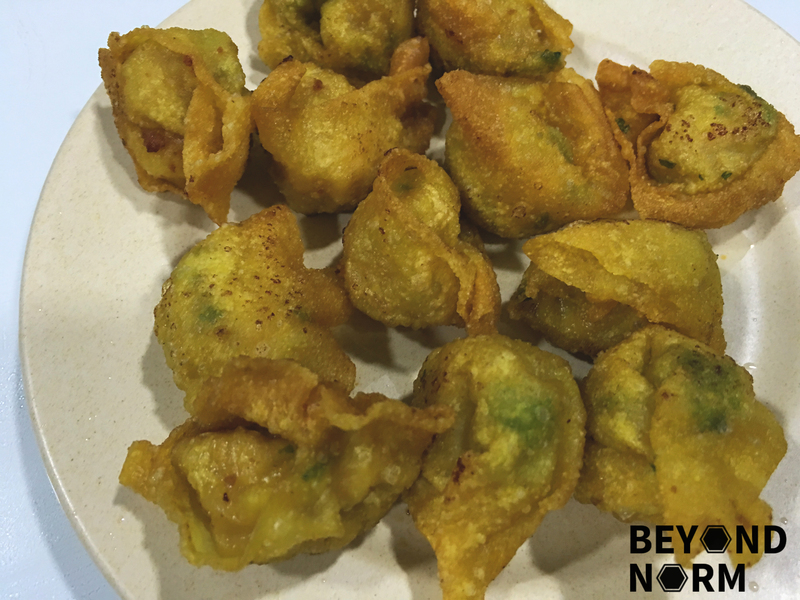 Serve with some sambal chilli and some black vinegar (if needed).